It is a fine comfortable feeling I have when I am weaving away without challenging myself….I have the warping, set-up, heddle-making and loom operation all under control. I have not had to ditch a warp because of a ”fail”in any of these areas in a long, long time. 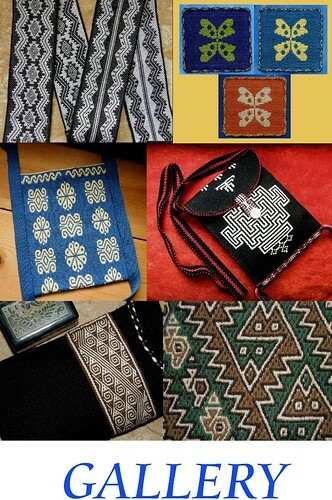 I guess I am quite at home for the most part with creating motifs and charting patterns too. But, throw in a little color challenge, I lose control and everything changes! 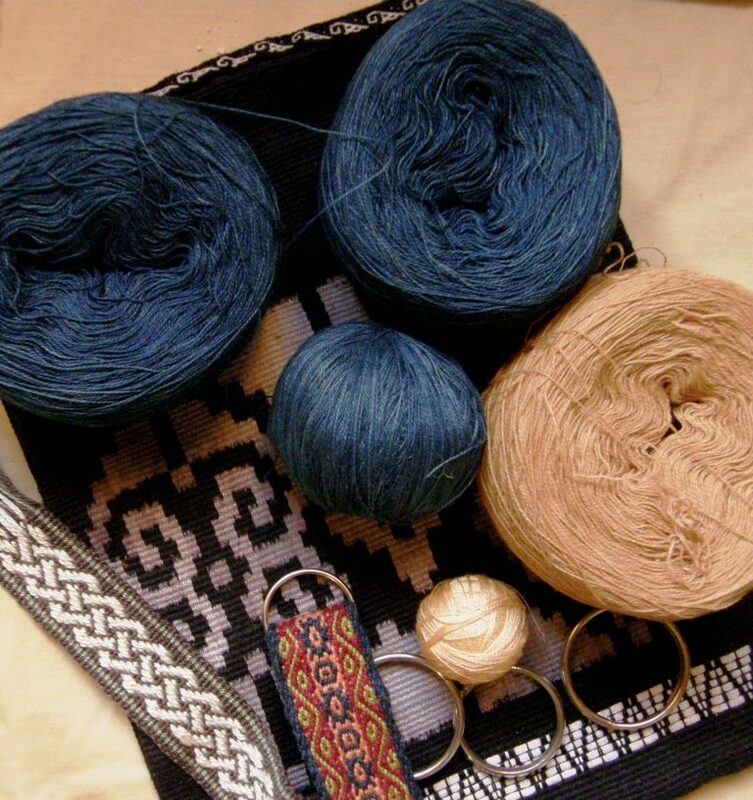 One of my personal challenges during the key fob WAL that we have been running on Ravelry this week was to take a bag of odds and ends of 3/2 perle cotton and put together some color combinations in plain weave…combinations that are not exactly natural for me. Yes, I am color-challenged. I had one result that I would call successful, the one pictured at left, one with which I am ”kind of” pleased and three ”fails”in the trash. It is funny how three colors that looked great together on their balls looked awful when warped up. Luckily, only tiny amounts of yarn were involved. There was no point in trying to salvage them. I like burying failed projects deep in the trash and then immediately pretending that they never happened….clean slate. 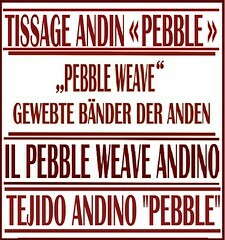 I can understand the way that fellow weavers in the WAL feel when they have had to trash their projects too….things get tangled, sticks fall out, warps slip off bars before they can be lashed, crosses get lost. Throw that teeny tiny warp away, take a deep breath and start afresh. That’s a five-strand braid at the end of my successful band. One of my students taught it to me and I love it. She had looked at me in horror when I had suggested finishing her band with lots of tiny four-strand round braids, my favorite braid for warp ends. She quickly grabbed all the ends and made this one fat attractive braid and then taught it to me. The looseness of this braid may not make it the best choice for a fob that will spend a lot of its life at the bottom of a handbag as the threads will most likely get snagged on things. This fob will hold one of my spare keys and will hang safely from a hook in my kitchen.There’s a tutorial for this five-strand flat braid here on my blog. 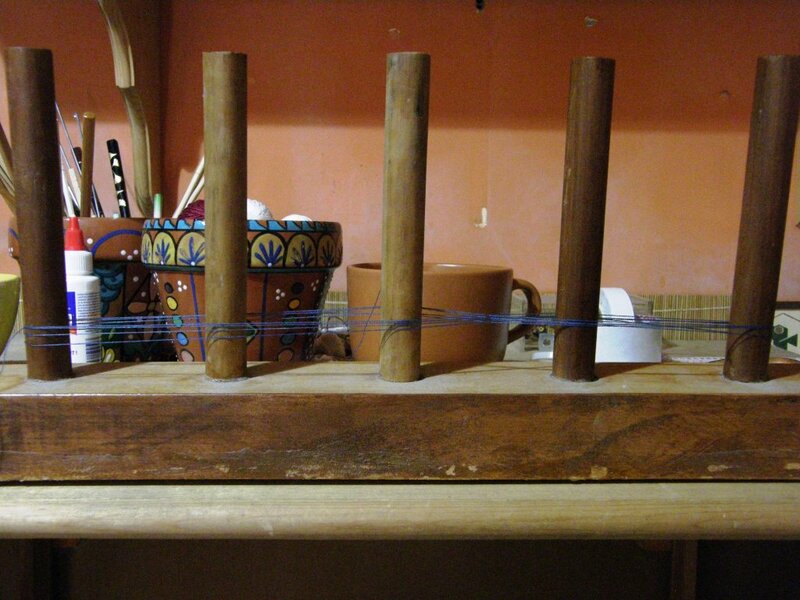 This is the warping board I have been using…. It was built for me when I first moved up to Bolivia from Chile in 1998 and this is the first time I am using it. It is really quite awful. Of the ten embedded stakes, only four don’t wobble. Of the four sturdy ones, none stand perfectly straight. The whole thing weighs a ton. I would never consider warping all the way up the stakes as the difference in the length of the warp from start to finish would be noticeable due to the leaning stakes. However, I figured that with these very narrow warps we are creating for keyfobs, I could get away with using it as long as I kept my warp turns low down on the stakes. It has worked well, so I guess it is not so awful after all. You can see the warp as it comes off the warping board with cross sticks in place. I attached it to my loom bar, and attached the other end to an S hook lashed to my bed. With the warp under tension, I made continuous string heddles around the ends on the near side of the cross and installed a shed loop around all the ends on the far side of the cross. In the last picture you see the warp all dressed up and ready to go. 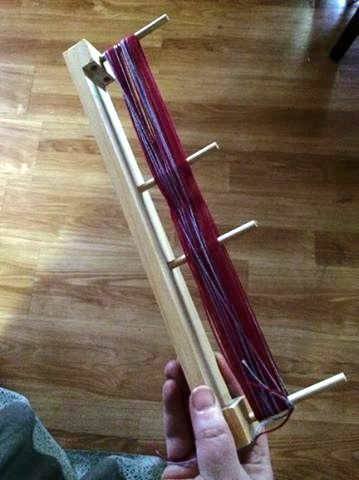 Here’s a mini warping board that my friend Ruth made. She can dismantle it, throw it in a bag and to take it to weaving get-togethers in other people’s homes. 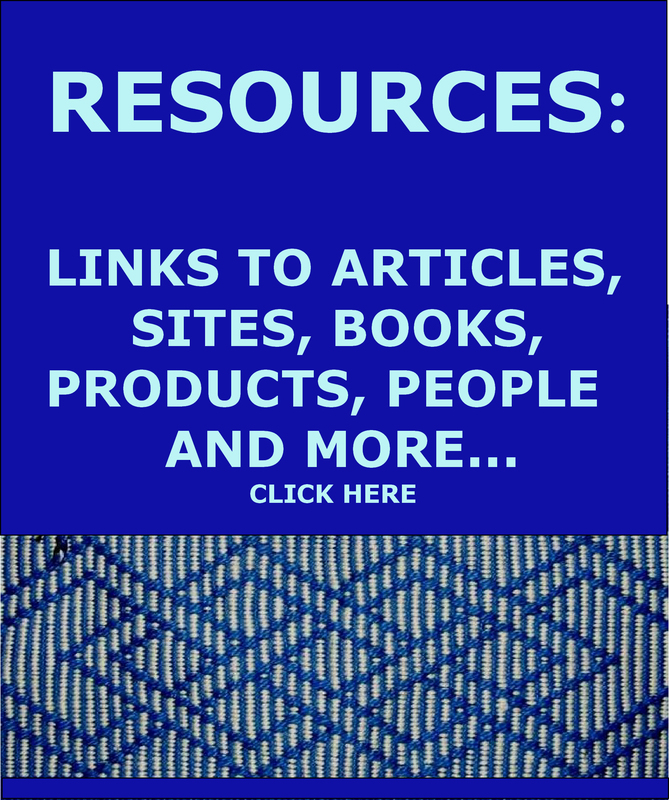 She gave us some instructions and tips for making and using it…. To make one, get a piece of wood about the size of a furring strip—what I had is about 1/2 inch thick by just under 2″ wide, and a dowel at least 1/4″ in diameter, and make sure you have an Xacto or other carving knife to cut and trim the doweling. a sanding tool and a little bit of glue are all you need besides. I recommend using the same size drill bit as the diameter of your doweling; you can wiggle the drill around a little bit in the hole to give yourself a little ease, without making it too loose. Eyeballing all measures, I cut the board to the size I wanted (you may vary the length you want by how large is your usual carry-bag) plus two more little pieces to glue onto the ends; drilled holes to seat the pegs in for carrying, and the four holes for the pegs to friction-fit into for use. 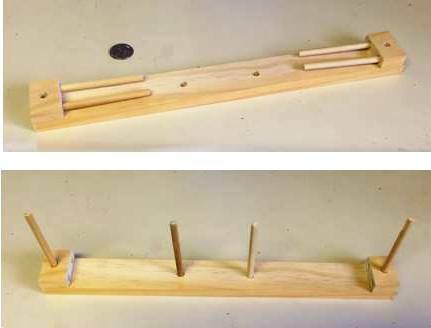 Here’s where you want to make sure your holes fit Just Right — you don’t want your pegs to lean inward at all when they’re under the tension that simple warping will put them under. If you’re unsure of your ability to drill vertically, use a drill press or a jig that ensures your drill bit is perpendicular to the wood in all ways. 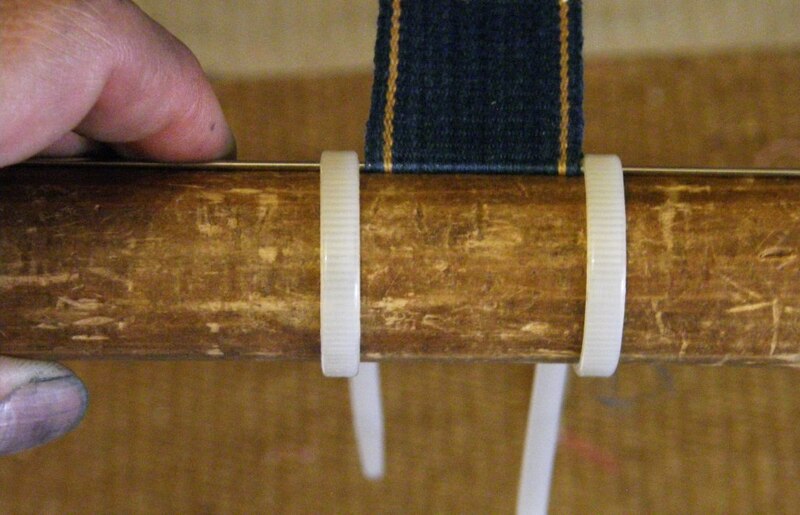 You can hold the stick in your hand or set it on a table while winding your warp, which is ideal for travel use: you don’t need clamps for this part. 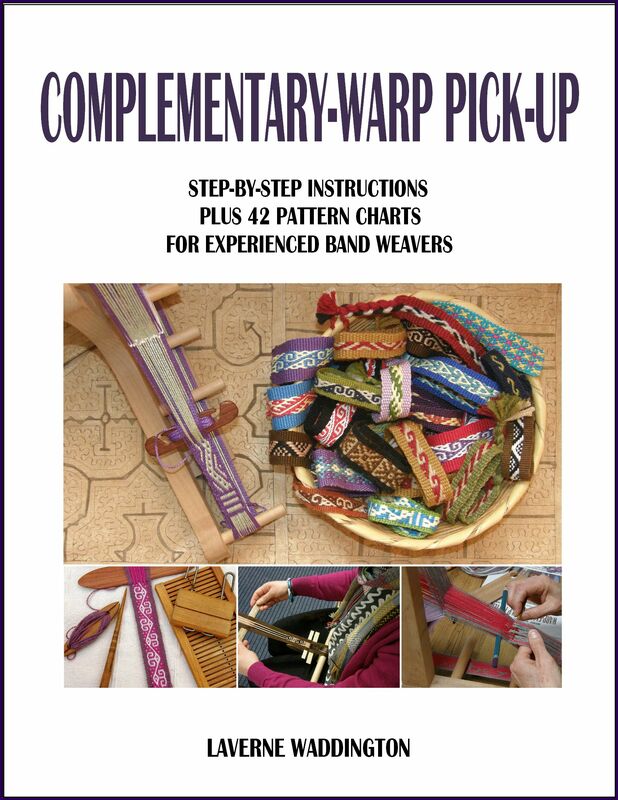 Make sure you pick it up by the base when you go to finalize your warp set-up and make your string heddles, or no matter how splendidly wedged a post you pick it up by, it will pop out. If (ha. when) this happens, you can pick up your cross again from the nearest peg, and all is well. Have fun practicing with many small warps! 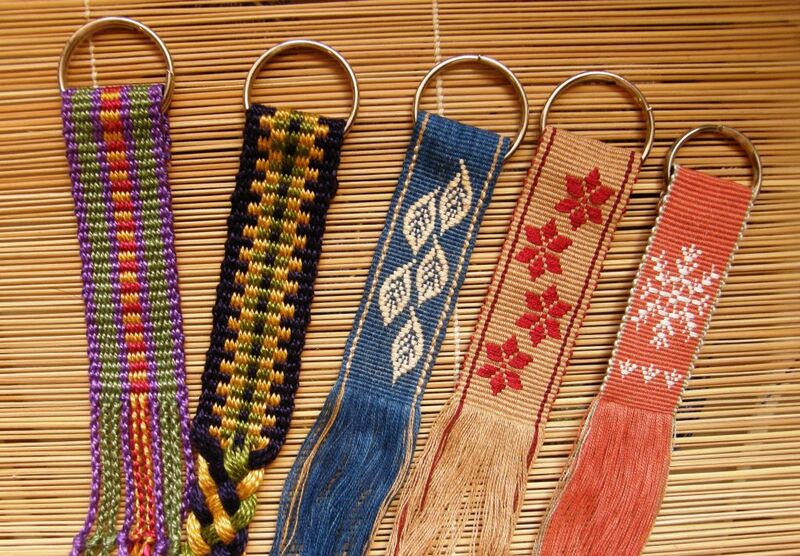 Apart from the occasional color failures, I have been finding weaving these fobs lots of fun and really relaxing. I have been using them as little breaks and rewards while I slog away at my large project. 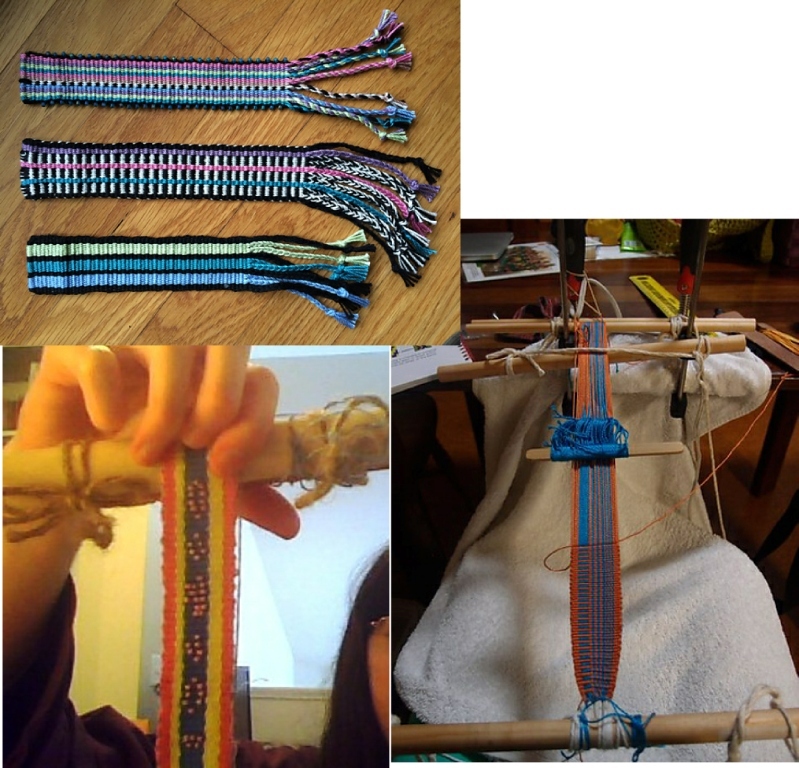 My large projects are usually fun and relaxing too and the weaving is all the reward I need, but the current one went wrong and I had to unweave three days of work. I needed some little rewards to get over that! Here is the fine Guatemalan cotton that I have been wanting to sample. This key fob WAL seemed like a fun way to do that. Cindy and I had bought this thread at ANWG in 2013. She bought a bag of the blue and I got the gold and we shared it. The tiny ball is the 60/2 silk that I have been using as supplementary weft. – Set up on the loom bar. 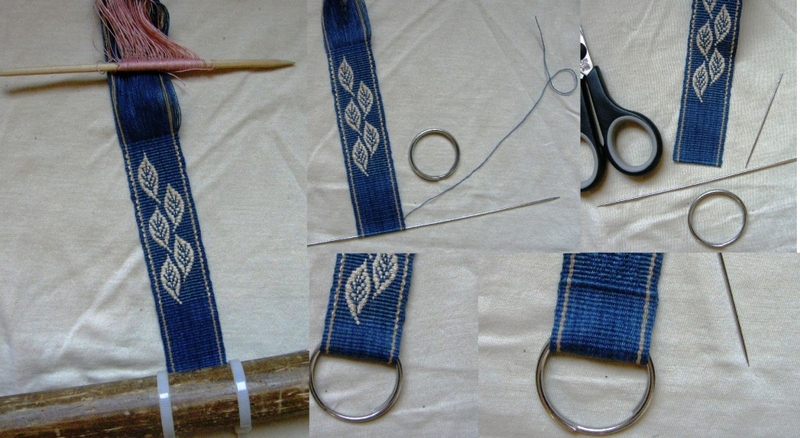 I am using a fine steel knitting needle lashed to loom bar with cable ties which enables me to create a third selvedge. 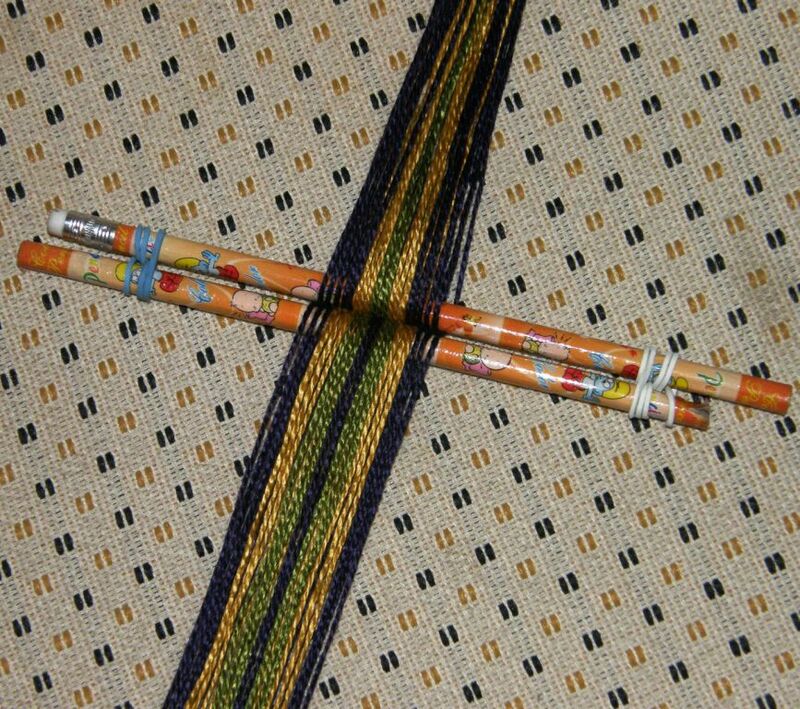 – Removed from the loom bar and with the weft tail ready. 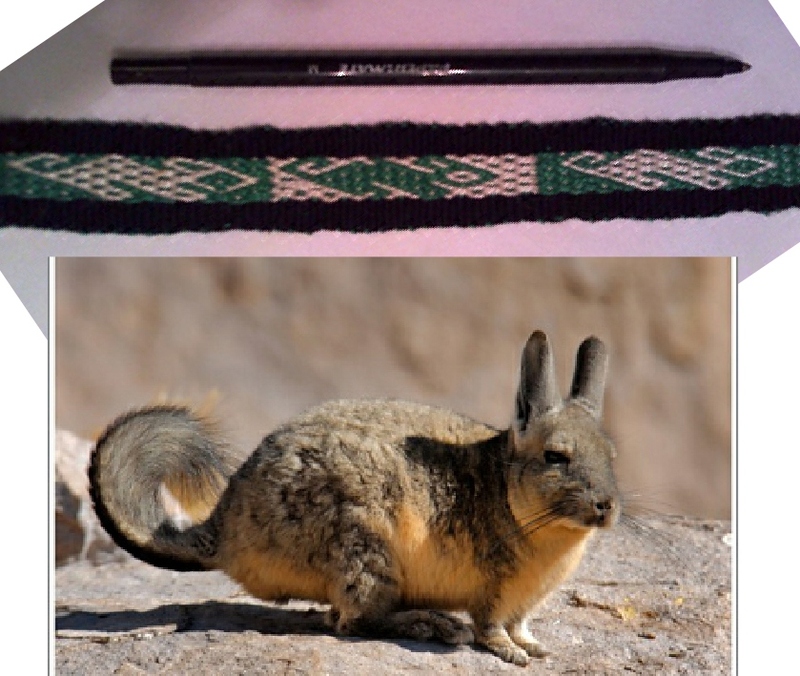 I will thread that tail on a sewing needle, remove the steel knitting needle and, using the sewing needle, fill the space it occupied with the weft. – Needle removed and space filled. – The end of the band is fed through the ring and folded. – The back of the band with the third selvedge that will be sewn down. In the meantime, Julia has been using the WAL to try out some Maypole 3-ply worsted wool (before you Google that, let me tell you that, alas, the stuff has been discontinued) and some 5/2 perle cotton. We all think that the chocolate and melon together look fabulous. I like her use of the weft twining at the ends of her bands. Janet has been using her gorgeous handspun. She only uses natural dyes now and but still has some yarn in her stash of handspun that she colored with synthetic dyes. The yarn in the upper bands is Perendale lamb dyed with cochineal and walnut husks. The lower one is natural alpaca and dyed kid mohair. 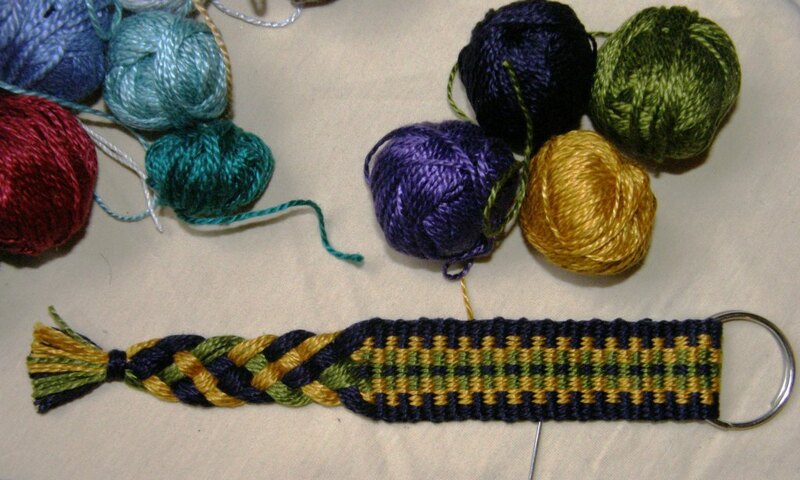 Linda made three bands using stripes and tiny horizontal bars all with nice third selvedges. Joyful had me looking for the the beads I bought while in the US last spring when I saw the way she had used beads in her band. 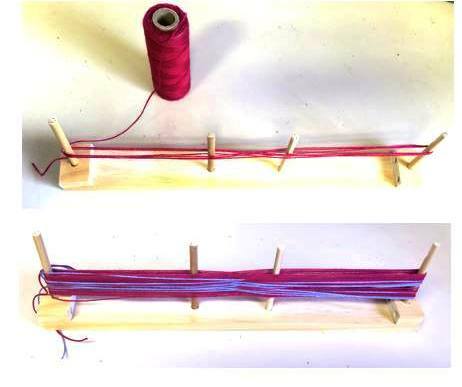 Our other Julia used the more traditional lashing method to attach her warp to her dowel and create the third selvedge. I love this combination of stripes and horizontal bars. 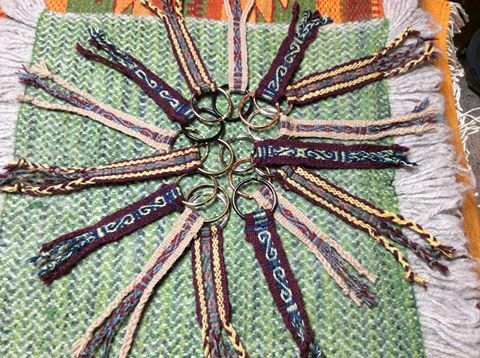 Here’s more handspun, this time from from Erin who actually made these fobs with Andean pick-up patterns before the WAL for an exchange amongst her weaving friends. She’ll be joining us to learn and practice some new techniques with cotton before trying them with her lovely wool yarn. She uses natural dyes. Betsy just started an Andean Pebble Weave fob with her handspun today and I will show you that next week when she has made a bit more progress, Each person’s handspun yarn has quite a different look and Betsy’s looks beautifully soft. I am back on track with my current large project after all that unweaving. It is the third panel in my ”bird” project. 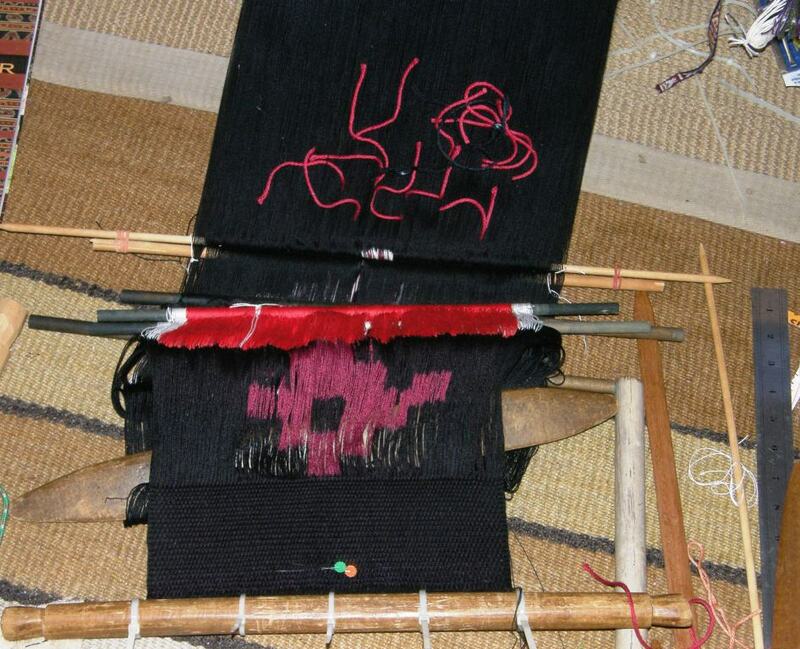 This panel will have bird shapes in ikat filled in with Andean Pebble Weave motifs in three colors. I have decided to make one bird red and black and the other white and black rather than mix all three colors in each bird. I think it would be a bit too busy that way. Besides, it is quite a fiddly technique that I haven’t used all that often and I want to keep things simple while I get back into it. What I am most pleased about so far is the ikat. I did some things differently this time and the ikat came out so very well even on the long sections. And the best part is that I know it wasn’t random and due to luck this time. There was only one tiny leak as wide as a pencil line. It feels like a nice reward for all the time spent experimenting. And now you are going to want to slap me because I am about to complain….I kind of miss the seepage! My ikat shape is sharp and clean and in-your-face. While I am very pleased with having gained control over the leaks, I think I actually prefer that fade-in-fade-out look when the dye seeps in at the edges of the motif. Anyway, I feel prepared to go on to large circles and other curved shapes now and securely wrap long areas….yay. Unweaving three days of work might sound like a lot of unweaving, but when you are doing pick-up it sometimes doesn’t represent a lot in terms of inches. 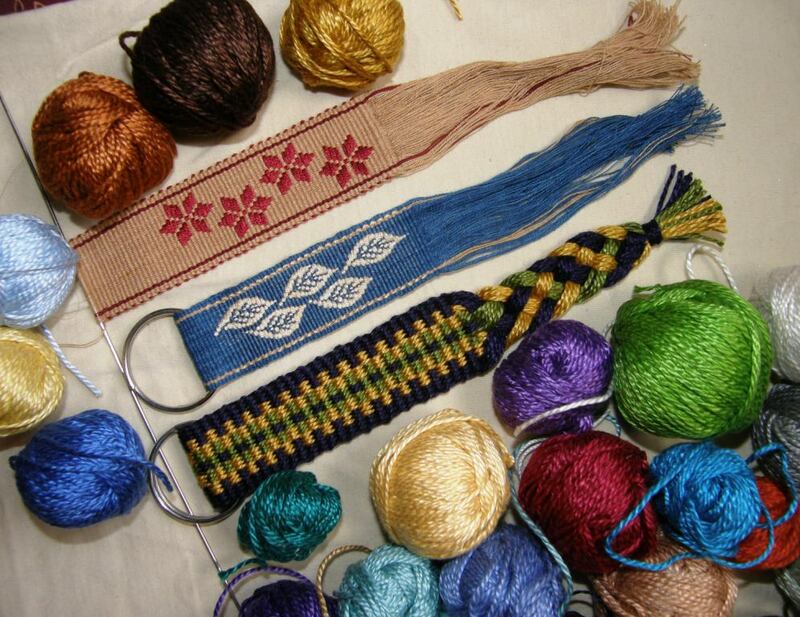 I think I have mentioned here before that one of my weaving teachers here told me that weaving the distance of four fingers is what she would consider a good day’s work. 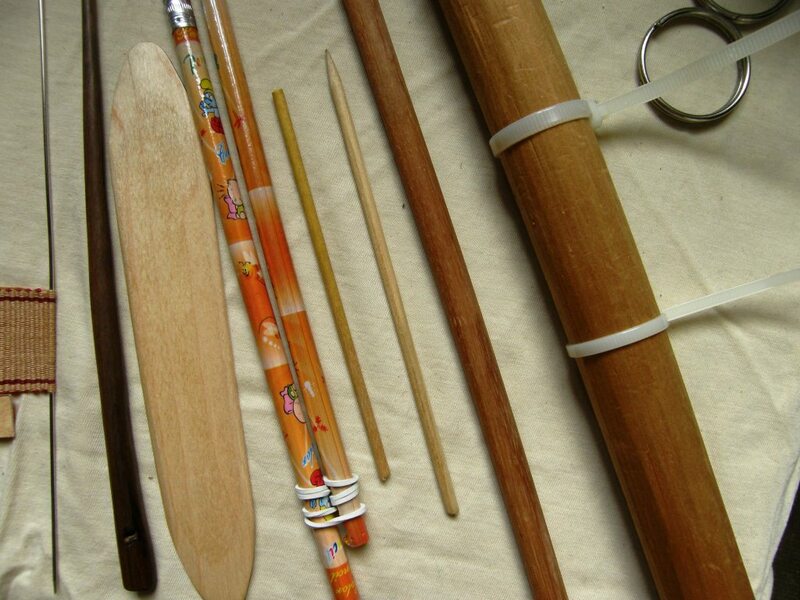 …pick-up stick (optional for supplementary-weft inlay), sword/beater, pencils for cross sticks, heddle stick, coil rod (optional…I use it to eliminate ridging in plain weave) far loom bar (optional… string through the warp ends can be looped over an S hook or over a big toe!) near loom bar with cable ties…the steel needle slips under the ties. The steel needle is also optional and my use of one is not traditional. 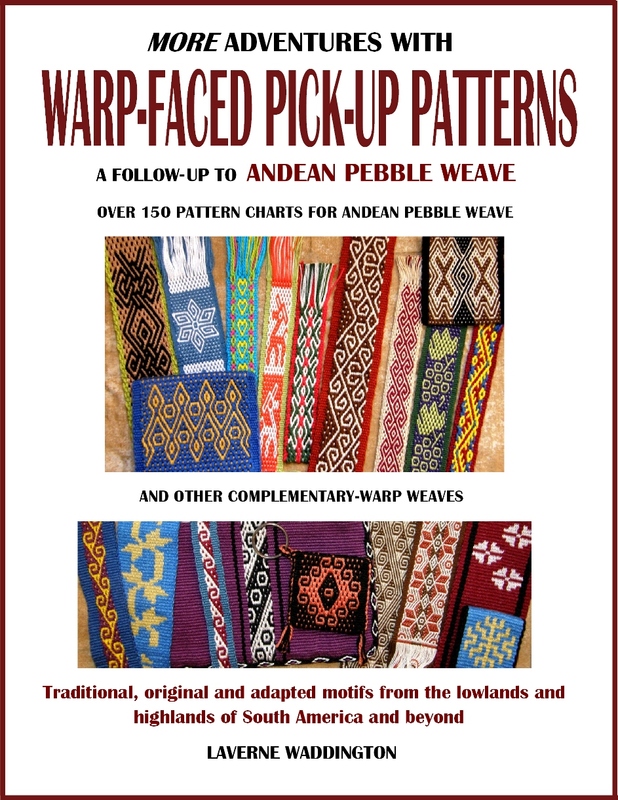 If you would like to see how a weaver from the Bolivian highlands lashes her warp to her loom bar take a look at the video on the right hand side of this webpage. 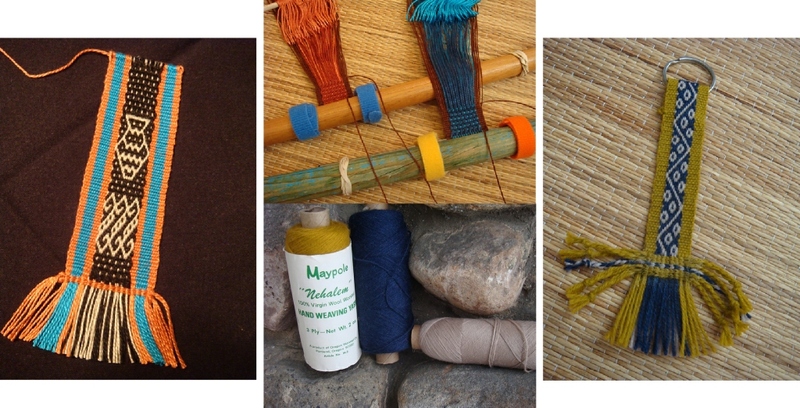 I have been using motifs that I wove into a ”Four Seasons” wool project some time ago. It’s been interesting seeing how my charted motifs look in this very fine cotton. It seemed fitting to weave that snow flake even in the middle of summer down here. Julia showed us snowy scenes from the window of her Pennsylvania home. Linda gave me a great reminder of how luscious a bold solid color can look in warp-faced plain weave. 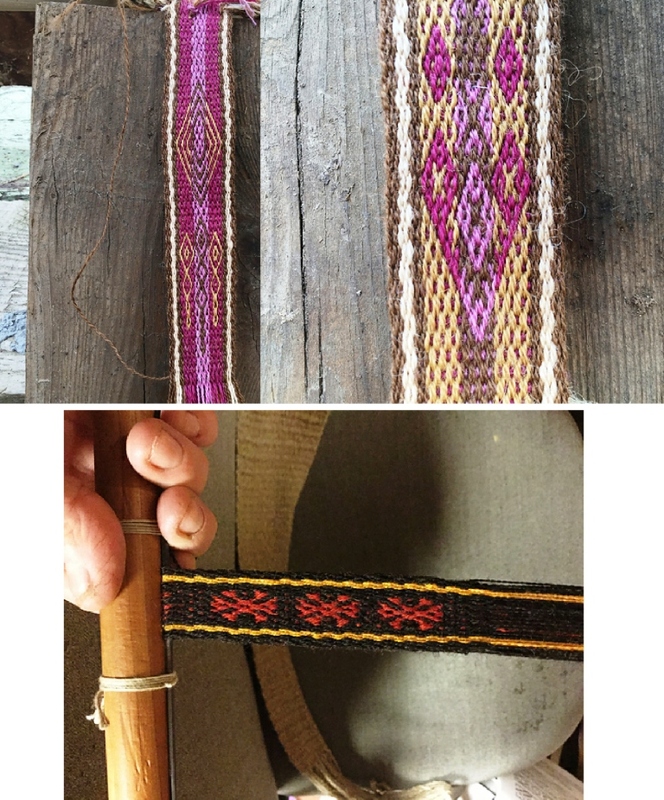 She has been weaving her fobs using a pillowcase as a backstrap and decided it was about time she had a woven one. 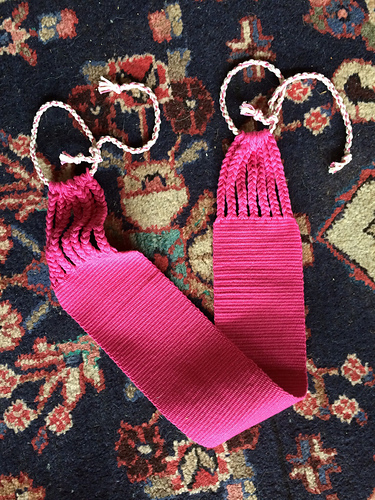 She used a cotton yarn that I had never heard of …Luisa Harding’s Jesse…and it really looks beautiful. I will get to meet Linda this spring and will have a chance to look at this up close. Now I have the urge to make a whole bunch of fobs in bold bright solid colors like this! Maybe some of my wee balls of 3/2 perle cotton will do the trick. Beads, solid colors, handspun..I have been rewarded with lots and ideas and motivation in just one week of WAL.